It’s no secret that I like to make something fun for Bean to wear on the holidays. I try to make things as subtle as possible so that they can be worn on other days too. For Valentine’s day I knew we were going out to dinner and that she should have a cute dress to wear. I quickly looked through my patterns (neatly stored in a file cabinet – LOVE) and found the perfect dress. I haven’t made a Go To Signature Dress (*affiliate link) since the fall of 2012. That’s really just a year and a half ago, but doesn’t that sound like an eternity? It is such a great pattern, with so many options and I’m happy it’s on my radar again. During the most recent KCW I was scanning through Sew Set for dresses to see what I might like to make. If you haven’t seen Sew Set it is worth checking out. It’s like an online catalog of sewing patterns and tutorials that you can scan by subject and whether they are free or for sale. It was created by Jess Abbott from The Sewing Rabbit and is just a genius idea. 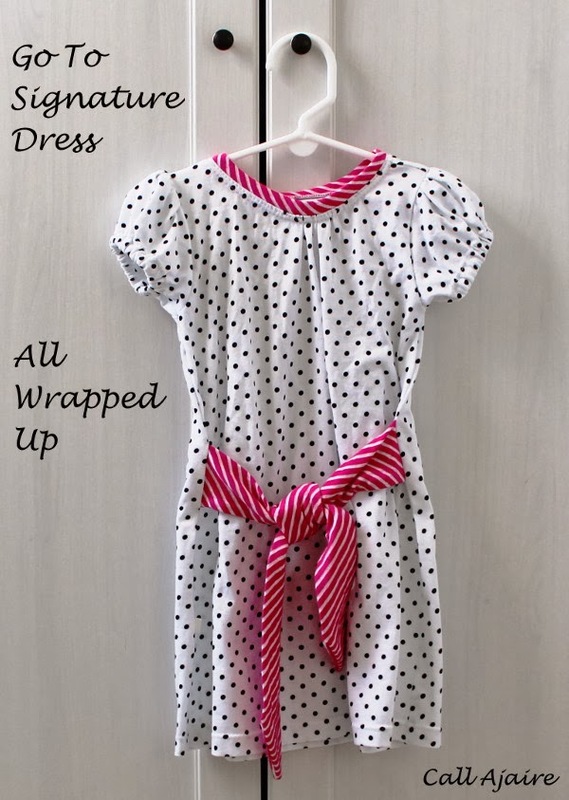 The dress that caught my eye was called the Wrapped Up dress from iCandy Handmade. I thought the tied band would be a perfect way to spice up the Go To Signature dress for Valentine’s day. I didn’t look at the tutorial, but it is offered for free and I assume it would include how to make her original dress. I just took the easy way out and used her front ties idea on a dress I was going to make anyway, hehe. During a Black Friday sale I bought these tiny polka dots from Michael Levine and I knew they’d be put to good use. 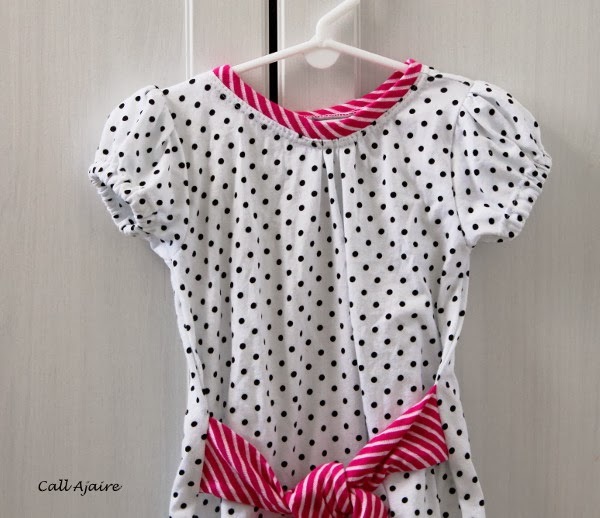 It’s a perfect little girl fabric for cuteness and comfort. I paired it with some leftovers of the bright pink striped JoAnn fabrics knit that I used for Bean’s Long Sleeved Banyan Tee. I didn’t do any gathers or shirring around the chest or back in order to leave the rest of the dress simple in design. 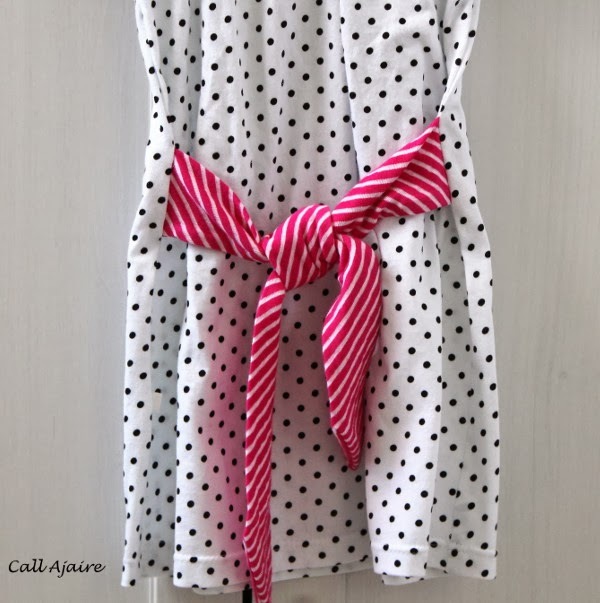 I thought the pop of stripes at the neckline and the tied band would be enough of a statement. I made the size 3T dress length and though it’s a little short it’s where I like her dresses to hit at this age. 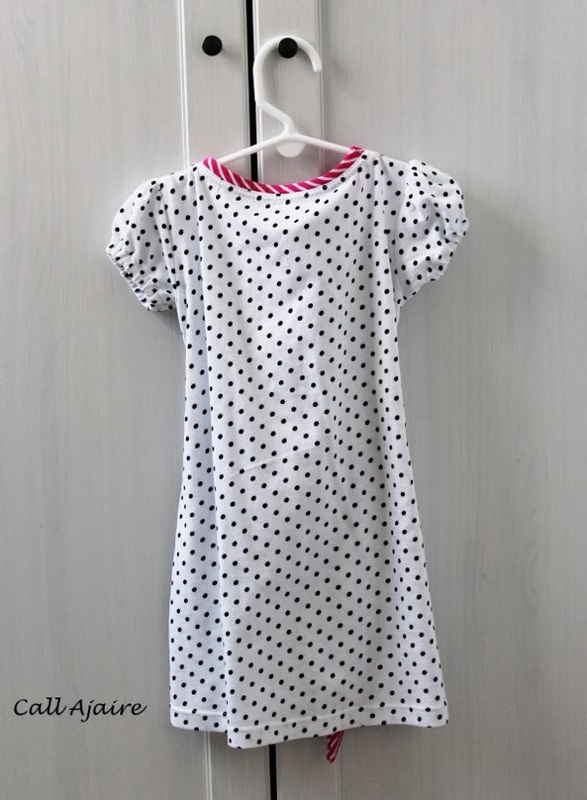 It’ll be perfect for spring/summer with leggings or shorts too. Since I hadn’t used the elastic cuffed short sleeve version of the pattern yet I thought I’d give it a go. It’s a similar look to a gathered and banded sleeve, but so much simpler. I love how it turned out. For our dinner Bean wore a pair of black tights and her black boots with the dress and it was really cute. She looked so grown up sitting at the table with us. 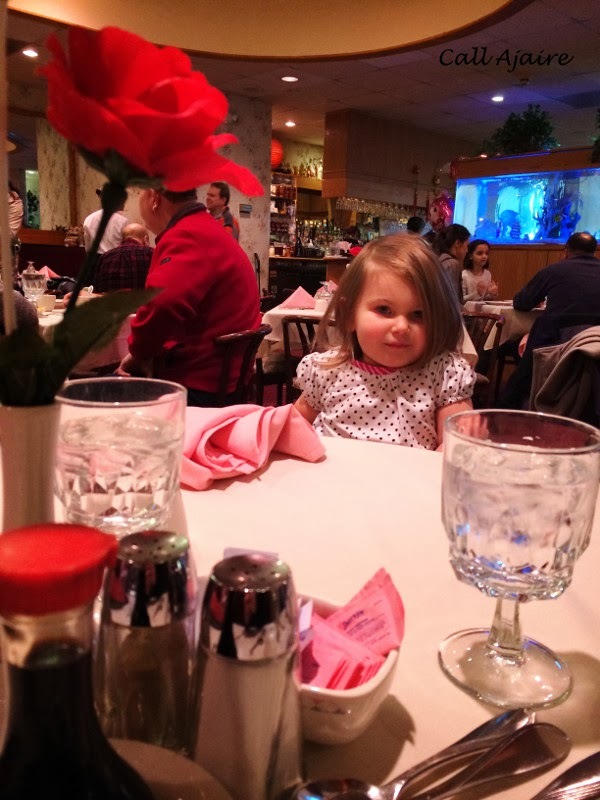 We’ve had only a few meals at this restaurant since she was born because it’s quite a drive from our house and it’s incredible how much of a difference I notice in her each time we go. We had a fantastic Valentine’s day and I’m so happy I dusted off a staple pattern (*affiliate link) to make this new dress. It can be easy to forget about those old standbys with so many great new patterns coming out all the time, but this one is always a winner. So cute!! And I love the contrasting fabrics. She looks so adorable! That is the sweetest dress ever. I am a big fan of sew set as well.